Jules finishes fifth grade just in time to move from her tiny New York apartment to a 300 acre ranch in Texas. While her mom overflows with confidence that she and Jules can care for the longhorn cattle, horses, dogs and cats on their own, Jules carries some doubts. Sure enough, zany adventures abound as she and her mom struggle to find their inner cowgirls. Through it all, Jules determines to remain positive. When tragedy strikes, though, she’ll have to reevaluate her feelings for her new Texas life. Turner really hits her stride in the scenes in which one wacky event follows another. In one, Jules struggles to get ready for school in the morning amid animals running amok. Another shows her frantically helping her party diva grandmother prepare for a Fourth of July barbecue. Lots of good-humored, clean fun. The writing feels young, which mostly works for a story in the middle grade genre. At times the story loses focus, and lingers in scenes and dialogue that don’t really move the plot forward. Overall, it’s a sweet story with a lot of humor and heart. Jules’ struggles over changing schools definitely seem believable. I wished her peer community had been better developed. I expected there to be a little more connection with friends in the story, as those relationships become more and more important in the middle grade years. The story primarily focused on Jules’ relationships with her family members, and those feel genuine and fun. Something about the story reminded me a little bit of the stories by Bill Wallace called Beauty (one of my favorites!) and Buffalo Gal. That’s Not Hay in My Hair is a lighter story about a modern city-girl-gone-cowgirl. But readers who’ve enjoyed one should consider trying the others. Several mentions of animal poop. At one point Jules slips on a cow patty. Jules mentions the church she and her mother attended weekly while they lived in New York. She also attends a Christian school, and at one point her teacher asks her to share a favorite Bible verse. Jules doesn’t know one off the top of her head, so she names a reference she sees on a classmate’s notebook. She or her mom pray at different points in the story. After the death of one of the animals, Jules wonders if the animal is in heaven. She sees an image of the animal that makes her believe so. The vet briefly references a Native American burial tradition. Jules and her mom live on and work a 300 acre ranch with cattle, horses, dogs and cats. At one point, an animal has to be put down. A vet handles everything. 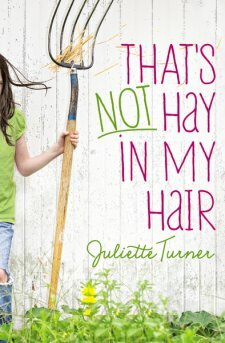 Tagged Booklook Bloggers, Horses, Juliette Turner, Ranch, Texas, That's Not Hay in My Hair, Zonderkidz. Bookmark the permalink. Sounds like a sweet story. I love the title! !